Excavations have brought to light a settlement with a sophisticated layout. 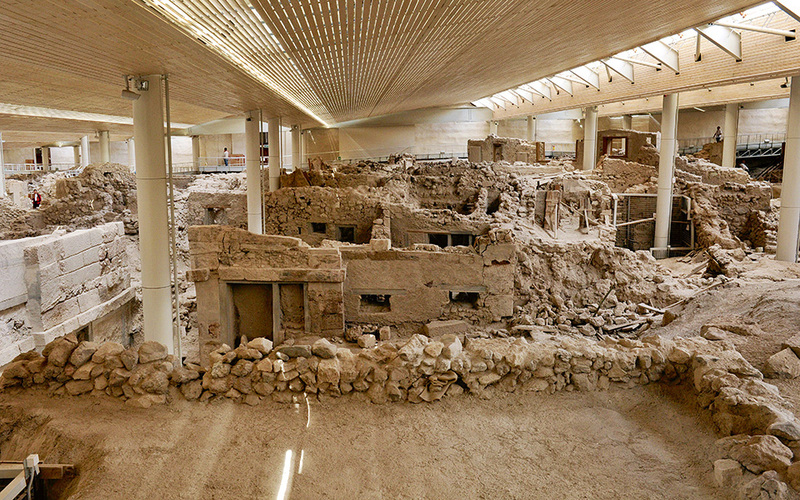 Christos Doumas, emeritus professor of archaeology, takes us on a tour of Akrotiri, one of the most spectacular archaeological sites in Europe. 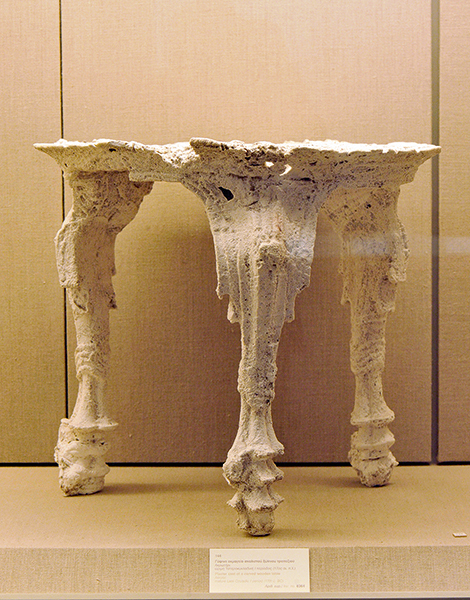 Akrotiri was a settlement with stone-paved streets and squares, a prudently designed zoning plan and an advanced sewage system. The houses were two- and three-story, built with stone and mud. The ground floors housed craftsmen’s workshops and storerooms, mainly for food. The rooms of the upper stories were bathed in natural light streaming in through large windows. Most walls were decorated with elaborate paintings depicting people, animals and plants. The furniture was wooden and the loom was an essential household item, used by the lady of the house to weave the family’s clothes. The inhabitants were traders, artisans, mariners, farmers, stock breeders and craftsmen. They kept flocks of sheep and goats. They planted wheat and barley, which they harvested with stone or bronze sickles. 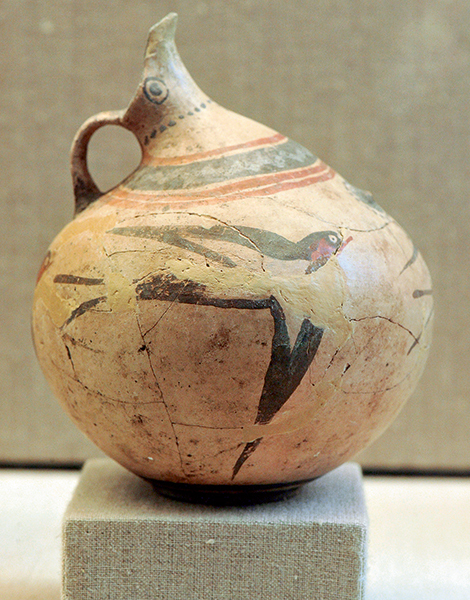 They stored produce in large earthenware jars and cultivated olives, from which they made oil. Indeed, output was so high that they also exported. Wine production was another key economic activity. Locals further supplemented their income by supplying Crete with large quantities of obsidian (black volcanic rock) and metals. Their diet consisted of pulses, vegetables and all sorts of fish, caught in the surrounding waters and sold in the harbor. But their favorite delicacy was snails, brought to the island from Crete. 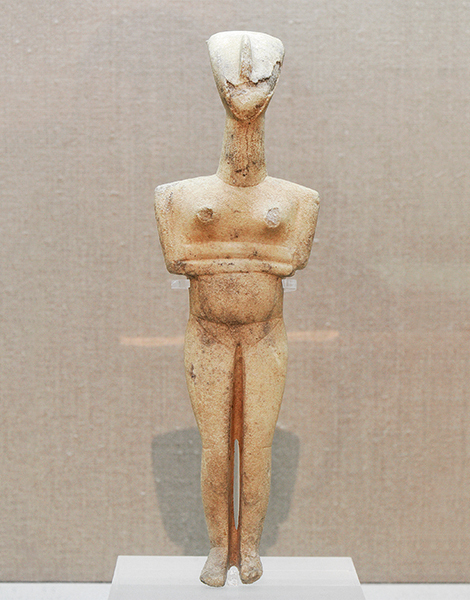 Visitors to the Museum of Prehistoric Thera never cease to be amazed by the masterpieces of prehistoric ceramic work. This then was the situation until the spring of 1613 BC, when the island’s volcano came out of its slumber. The eruption that followed, the most powerful in the world of the past 10,000 years, completely destroyed Santorini (Thera) and the nearby islands. “If there had been no volcano, however, there would have been no Santorini as we know it today and, of course, there would have been no Akrotiri. Thanks to the volcanic ash, the remains of the prehistoric settlement have been preserved down the centuries,” explains the man who has made this place his life’s work. In 1975 Doumas took over the excavations begun by the eminent archaeologist Spyridon Marinatos. Since then, he has brought to light an incredible wealth of information about the “Pompeii of the Aegean.” And at the age of 82 he continues to work ceaselessly. “We should be proud of Akrotiri,” says Doumas. “It is part of archaeology courses at universities all over the world. In the history of Aegean civilization, it is considered to have equal importance with the Acropolis (for the Classical period) and Mount Athos (for the Byzantine period). 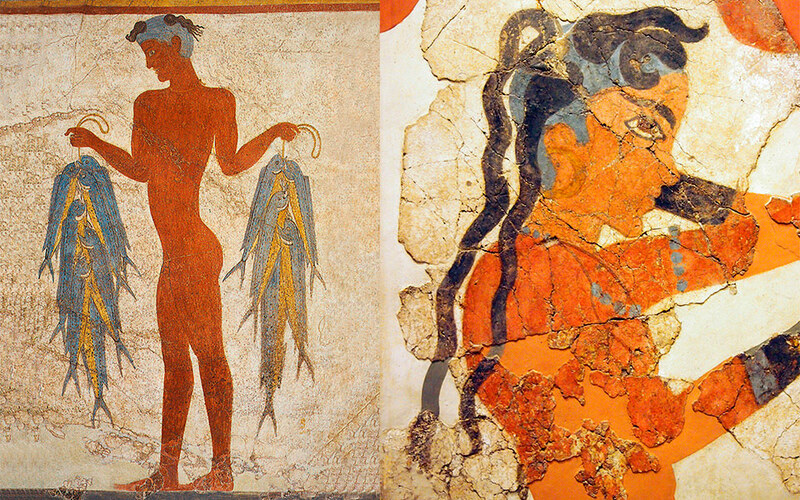 It is a momentous legacy.” All this makes a visit to Akrotiri a unique experience. The archaeological site (covering an area of 12,000 m2) is protected by a bioclimatic shelter that is supported by 96 steel columns, designed by the architect Nikos Fintikakis. Specially designed walkways take visitors around and through the settlement, while there are viewing platforms that provide excellent vantage points. 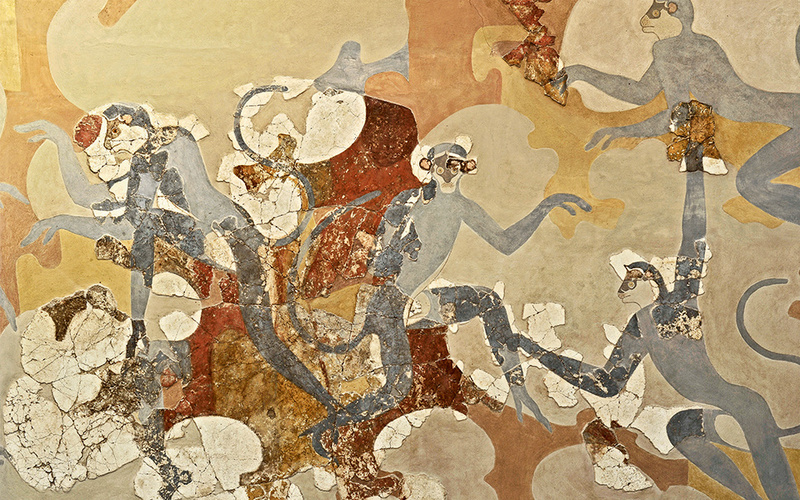 AKROTIRI lies at the south-western tip of the island, 15 km from Fira • The ARCHAEOLOGICAL SITE is open 8 a.m. – 8 p.m., daily (until the end of October) • Tel. 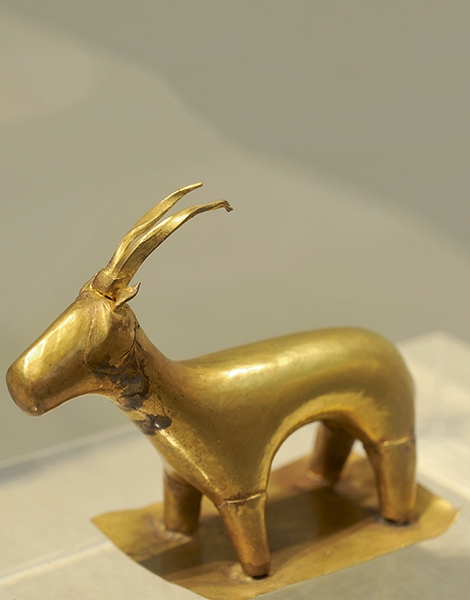 (+30) 22860.81.939 • MUSEUM OF PREHISTORIC THERA: Fira • Tel. (+30) 22860.23.217, Open daily except Mondays (8 a.m. – 3 p.m.) • DON’T FORGET to buy original souvenirs and objects of art from the newly installed wooden kiosk of the non-profit Society for the Promotion of Studies on Prehistoric Thera, just outside the complex. All proceeds go toward the excavation and restoration work in Akrotiri.